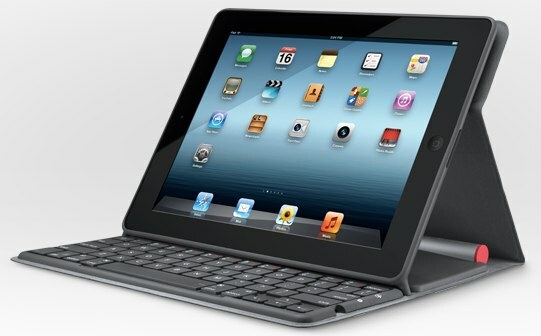 Logitech Solar Keyboard Folio to be Won! Time for another great giveaway on iSource! If you are in the market for a Bluetooth keyboard for your iPad 2 or new iPad, we’ve got a treat for you. 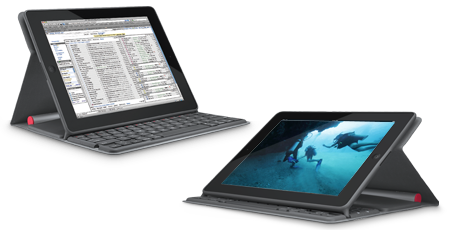 Today we are running a contest for a Logitech Solar Keyboard Folio typically retailing for $130. Earlier this week our own Jhrogersii added to his arsenal of iPad Bluetooth keyboards with an extensive review of the Logitech Solar. Whether you want to type an email or watch a video, the multiview stand holds your iPad —so you don’t have to—and provides two viewing options for your comfort. In entertainment mode, the conveniently placed media keys let you play, pause and change volume instantly. In typing mode, you’ll enjoy the full keyboard. *** Just add a comment to this post, making sure to fill out the ‘email address‘ field (don‘t worry, it won’t be displayed and we won‘t use it for any other reason than to contact you if you win) “ and you‘re in with an entry for our random winning drawing on Friday. That‘s it! We‘ll draw our winner on Friday (7/27/12) sometime after 10:00 pm US Eastern time. Solar keyboard would be quite the scene,my IPad wouldn’t be the same in the spring,standing up straight and tall, hoping not to have a great fall,and typing would no longer be the same old thing. Count me in, I’d love one of these (please!). Looks like a great addon! As a brand new oPad owner, having a case like this would be hugely helpful. One or two dings and I will be a sad customer with out it. This would make my iPad accessory arsonal complete. Please pick me! I would LOVE one of these, it would seriously help me out as I need to get a keyboard and a case for the iPad. This would help financially and environmentally, so count me in iSource! That would really make typing this comment out on my iPad a lot easier! This would be awesome to have. I already use my iPad for pretty much everything. This would round out the rest of the stuff I need to do elsewhere. Love how the Apple Bluetooth keyboard works with the iPad. This sounds like the perfect solution. Would love to use this every single day, looks amazing! This looks great! Would love to use it with my iPad! I have been looking at iPad keyboards for a while… the apple blue tooth keyboard is really nice, but just doesn’t fit my use case. This one looks pretty perfect! The solar function makes this the best keyboard case I’ve seen yet. I would love this. Very interesting, I’d love to win if only to try the first row buttons in movie position myself. Sweet! That’d be cool to have! As teachers, my wife and I could really use one of these to help make our Keynotes and Pages documents! I would love, love, LOVE to win this!!! I need to stay as green as possible, this keyboard makes me greener. I love my Ipad, I use it everyday (both summer and during school year) with my students and everything I do while I am teaching. The best thing would be is to have a case like this one to make it easier to use more in the classroom. Ooh I need one of these for my iPad! I have one keyboard but this one sure does beat it. Would love to win this!!! Winner was selected on July 27.